Albany Diocesan Cemeteries’ annual Anatomical Gift Program Memorial Service took place on Monday, August 13, 2018. Each year, Historic St. Agnes Cemetery in Menands donates grave space and interment services to provide dignified burial for Catholics who have donated their bodies to the Anatomical Gift Program at the Albany Medical College (AMC) and wish to be interred at Historic St. Agnes Cemetery. Celebrant Deacon Jim O’Rourke lead family, friends, AMC staff and medical students in a very poignant memorial service in the St. Agnes Mausoleum in celebration of the life and in honor of the generosity of the following 19 people who made this sacrifice: Helen Catherine Baldes, Karen Brooks, Jane Francis Daviero, Daniel P. Fuino, Joan T. Gannon, Bertrand Francis Gould, Ronald P. Haddad, Lloyd P. Jonas, Rowena Jonas, Margaret Lalor, Harry E. Maciejewski, David Mayersohn, Wesley R. Murtha, Thomas F. Remmert, Genevieve M. Reynolds, Ken Scoggins, Emma J. Seebold, Patricia C. Stanley, and Charlotte D. Willard. The medical students spoke with respect to family, friends and classmates about how the donors not only helped them with their medical training, but also each person and family who will come to see them throughout their career with illnesses that they will be able to treat, thanks to the donation and training the donors and their families provided. In 1983 Albany Diocesan Cemeteries partnered with Albany Medical Center to offer grave space in appreciation and respect for the sacrifice that these individuals and their families have made for medical science. Since then, 521 Anatomical Gift interments have been completed at St. Agnes. When studies by the medical students are completed, the body is cremated and placed in an urn. After the memorial service, each urn is buried in an individual grave. The grave has enough space to permit the burial of a second urn, of a spouse or close relative. 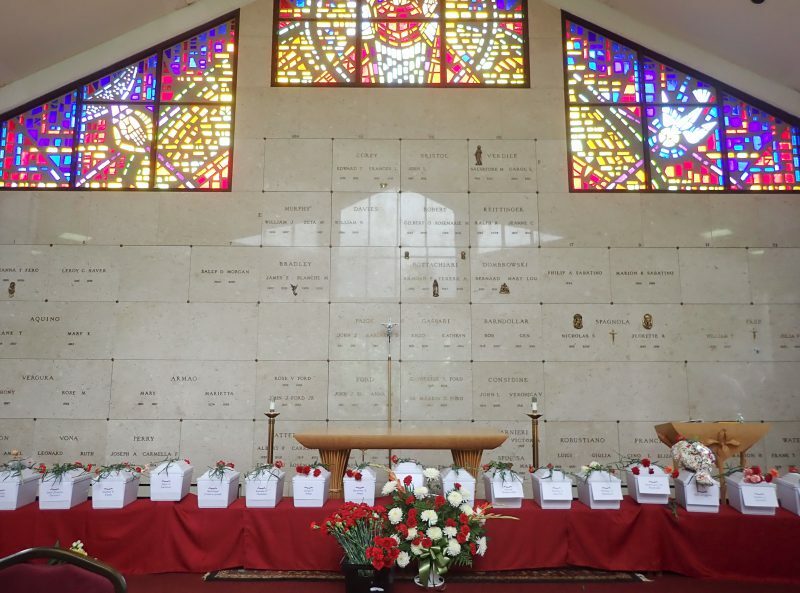 Families may choose to memorialize the grave with a bronze memorial and flower vase. Bronze memorials may be purchased through the cemetery. Catholic cemeteries are sacred not only because of a blessing or consecration, but also by the sacred functions performed on behalf of the entire Christian community: holding the bodies, once temples of the Holy Spirit, until the Lord comes again in glory. Albany Diocesan Cemeteries is honored to donate services and grave space in recognition of the generous gift that these donors and their families provide. The grave has enough space to permit the burial of a second urn, of a spouse or close relative. does it have to be a relative? can you “donate” the extra space to a person who would otherwise have no resources for a grave – i/e. homeless? Albany Diocesan Cemeteries manages Our Lady of Angels Cemetery in Colonie. I’ll have one of our Family Service Representatives e-mail you to help answer your questions regarding your families remaining grave space.